As most of you know by now, a notorious commercial, legal hacking group named "Hacking Team" was recently hacked. As part of the hack, thousands of emails and other material on their servers was divulged. Among the material released were three zero-day exploits. In this tutorial, we will walk through the steps to load one of them, which has become known as the CVE-2015-5119 exploit. 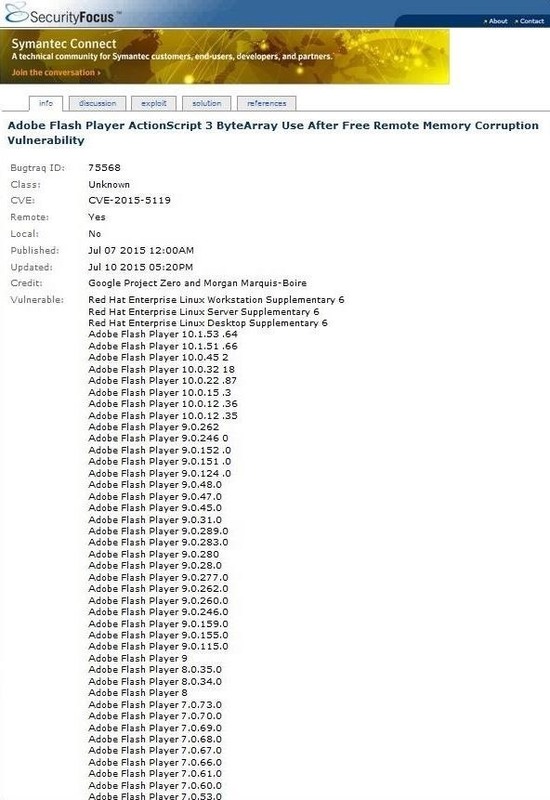 As most of you know, I think that Adobe's Flash application is among the most vulnerable applications known to mankind. New vulnerabilities and exploits are found nearly daily. When I am advising highly secure environments such as banks and the military, I advise that Adobe Flash should be banned from all systems within the organization in order to remain secure. Fortunately for you hackers, few organizations heed this advice. The Hacking Team dump took place Sunday, July 5th, with millions of emails and other material downloaded and placed on WikiLeaks. Within days, a developer at Rapid7 had integrated this zero-day into a new Metasploit exploit. Unfortunately, as of July 13th, it is still not available from Rapid7 via msfupdate. However, it is available in a number of different places including SecurityFocus. I wanted to get this code to you as soon as possible while this vulnerability is still largely un-patched. Let's begin by going to securityfocus.com/vulnerabilities. There, let's search for CVE-2015-5119. When you do so, you will come to this vulnerability as seen below. We can then click on the "Exploit" tab, and it will show us a link to the exploit as seen below. 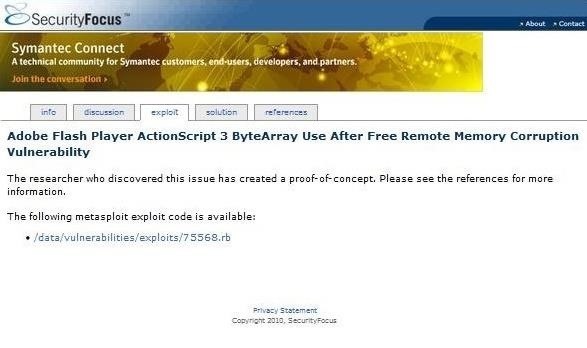 Click on the link and it will open a screen with the exploit code. Copy and paste it into a text file. Now save that text file to your Desktop naming it adobe_hackingteam_exploit.rb. You can name it whatever you want, but if you aren't familiar with Metasploit, follow my instructions precisely to simplify this process and to increase the likelihood of success. As you can see, our new Hacking Team exploit has been moved to the proper directory for use with Metasploit. If you don't have that directory, simply create it with mkdir. Finally, let's get a bit of information about our new exploit. Although Adobe has released a patch for this exploit, there are still likely millions of systems still vulnerable to this attack. Now that we have this exploit locked and loaded, I will show you how to use this exploit in a future tutorial. If you can't wait until then (I understand), take a look at my other Adobe Metasploit hack tutorial. This one works very similarly. Always in first line for Security Awareness. Thanks OTW. Yes, but this exploit is only for those listed in the info section. I hope that tutorial on how to use it comes out soon. Does it require Social Engineering? Yes because the exploit requires the target to go to a specified URL. Agreed Kitten, I would like to see a tutorial on this too. My knowledge on flash is very little. In the meantime, check out one of my other Adobe Flash tutorials. The process is the same. OTW thanks for post! Great as always. Just a question have you got hands on HackingTeam android exploit? Did you install the exploit as I showed you in this tutorial? Yes, i did everything just like u showed. Can i Create the Folder and the .swf manually? Please use the directory structure I showed in the tutorial. You are using the wrong directory and that is why you are throwing the errors. The only bad thing about this exploit is that only 32 bit systems are vulnerable. Most computers today use 64bit as standard, only long standing machines (Like the ones the Navy use), will be vulnerable to this. --> I followed exactly the steps as you documented as above. --> I see there are 2 seems to be typo error. --> Two different path: .msf4 or msf? * Exploit running as background job. --> I mkdir the path and touch the file. Not sure if I should touch the msf.swf file manually. --> I tried to browse the exploit link in a Win7 32bit, and Adobe Flash Player 11.2.202.235 environment, I didn't get the meterpreter command. Can you advise me if I missed anything out? 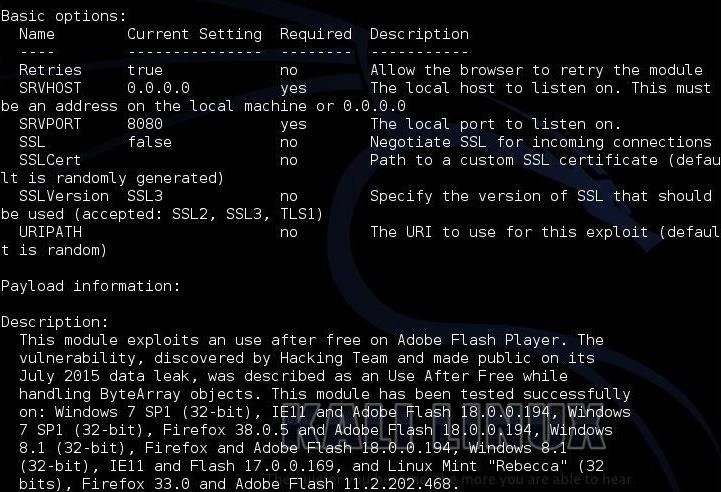 msf exploit(adobehackingteamexploit) > * 172.16.174.254 adobehackingteamexploit - Gathering target information. * 172.16.174.254 adobehackingteamexploit - Sending HTML response. "Exploit requirement(s) not met: ua(underscore)name. For more info: http://r-7.co/PVbcgx"
If you follow the link, it says, if you get the error ua_name, it means that it's the wrong browser. Google Chrome cannot be exploited from this exploit.. I really love your tutorials. They have sparked a love of computers (and a fear). Im having trouble with this exploit though. Im trying to hack fire fox on a Windows 8.1 computer. I haven't updated Flash in a while though. The messages stays stuck on sending HTML response. When i did it to my XP it stayed stuck on sending SWF. I love this site and all help would be greatly appreciated. I seem to have succeeded in connecting into a session with meterpreter but, I have reached complications. I tried to getsystem using windows/meterpreter/reverse_https using excel to exploit it. but it fails so I try to put it in the background and set another payload but when hit exploit it connects to another meterpreter session and then the computer on which I am practicing on to be the victim shows windows powershell stopped working. which then om my linux computer closes the meterpreter session it just opened. So again then I am stuck at not getsystem since it is only limited. plz help. http://postimg.org/image/iva41vys9/ = My first try. I don't know whats wrong. I want to make it work on WAN. Maybe i made some mistake port forwarding? http://postimg.org/image/mj19jeitz/ = Port Forwarding setting. And i have DMZ disabled on the port forwarding tab. Should i enable it in order to get the exploit working? Is this the correct way to set DMZ? And please let me know how to get this work on WAN. The error message in both cases is telling you that the port is in use. Either you are using that port for some other purpose or you need to restart the webserver for this exploit. http://postimg.org/image/i2bsfu40n/ It worked this time. But i don't want a LAN address. I want a WAN adress which can run on any PC outside my network. Any help on my previous post??????? Try asking that question again. I can't understand what you are asking in that question.
! 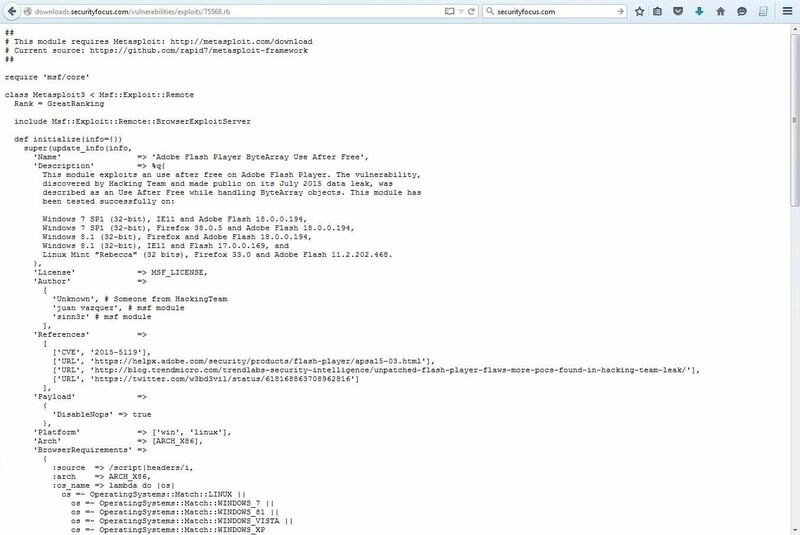 x.x.x.x adobehackingteamuaf - Exploit requirement(s) not met: flash. The error message is pretty clear. It says "Exploit requirements not met". An elite hacking team uses windows, quite interesting!